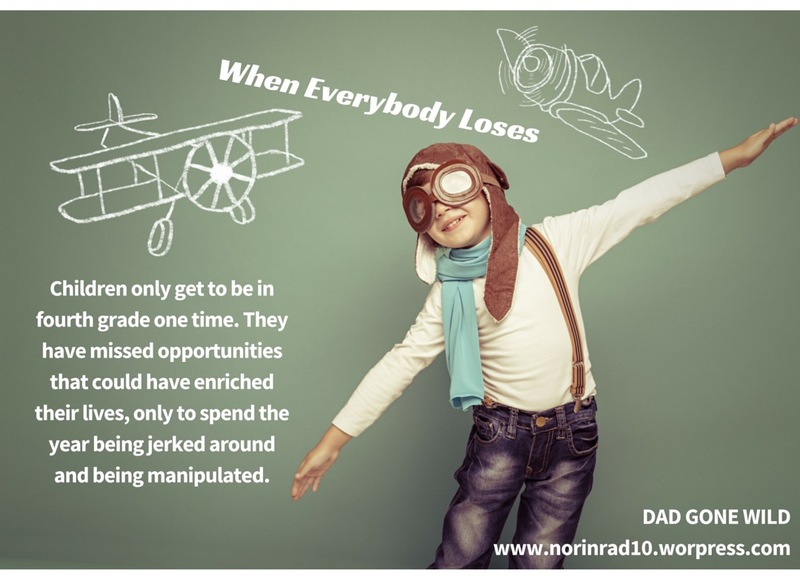 Around my house, you will often hear the refrain, “Daddy, you said you were going to do that. It’s important that you do what you say you will. You always say that.” You see, we’ve instilled in the kids from an early age that accountability is a two-way street and that everybody has to practice what they preach and when we say everybody, we mean everybody. We believe that if you don’t hold yourself accountable, you certainly can’t expect it from others. For example, the kids like to wrestle on the bed before bath time. On occasion, I’ll be too tired and beg off with a promise to wrestle an extra 20 minutes the next night. Next night comes, and I’m too tired again and attempt to beg off. That’s when the kids call me out and it’s up to me to keep the promise I made. It’s not always what I want to do, but in the long run it reinforces an important tenet. The Tennessee Department of Education got a bit of a lesson on that this year. Politicians and State officials preach accountability like it was John 3:16, but when it’s time for the rubber to meet the road they continually refuse to apply the Gospel to themselves. Case in point: the annual standardized tests that are used to measure the performance of schools, teachers, and students. The last two years have seen repeated missteps, post-equating, and questionable cut scores, culminating this year in the whole system crashing . It was clear to any impartial observer that the state was acting under a flawed process that needed to be addressed. Some would argue that the issues with the test a couple years ago had a hand in forcing out then Education Commissioner Kevin Huffman. When his successor, Candice McQueen, arrived, there was great hope that she would learn from past mistakes, and we would see an improved process. Unfortunately, that hasn’t been the case. Questions on how scores were calculated arose and once again people were questioning the value of the tests and competency of the TNDOE. Parent and teacher voices increased in demanding a review of the process and a cutting down on both the number and emphasis of the tests. Once again the TDOE turned a deaf ear and miscalculated that they could just proceed unencumbered by offering lip service to stakeholders and doubling down the path they were on. Their response to the criticism was to create committees and task forces. Parents, teachers, standards, textbooks, testing – they all got their own task force or committee. Problem was that none of these task forces/committees were populated with people who didn’t already support the policies of the TDOE. Take the parent group, for example: applicants had to be referred by their principals, and activist parents across the state quickly secured these referrals only to have every single activist parent denied a seat at the table. Instead, the state went with 15 parents from across the state who, while certainly qualified, shared a greater affinity for state policy than some of their counterparts. Furthermore, name me one policy that any of these task forces have had an impact on. They seem to exist for DOE purposes only. I always like to use the analogy of a highway when discussing failures. In analyzing how we get to a FUBAR situation, there are invariably exit ramps that we could have taken to avoid the disaster. But for some reason we chose not to and just flew by each and every one of them, resulting in an avoidable catastrophe. Tennessee’s TNReady fiasco is no different. There were warning signs back in October that there would be technical issues. When the system crashed in February, when paper tests were late for Part I, when parents, teachers, administrators, and legislators all began openly questioning our readiness – after all these warnings, we could have put on our turn signal and exited. But again and again, we chose to just turn up the radio and hit the gas. Because of those choices, we now find ourselves in what is akin to a 50-car pile up as the state finally decided to cancel all remaining testing for grades 3-8 across the state. In some ways, the canceling of the statewide tests feels like a win. There is a great feeling of “I told you so,” which is very tempting to bask in. Especially when you’ve worked as hard and been ignored as much as parent groups have been. We need to resist that temptation though, because let’s be perfectly clear, this is not a win for anybody. Quite the contrary, this is a huge loss for everyone, though not in the way the DOE thinks it is. And once again, those being asked to absorb the loss are the very ones we demand the most of: students and teachers. My good friend Chris Moth counsels me to not swear in a blog for general consumption. That’s good counsel, but sometimes the actions in question are so egregious that the strongest language is the only way to drive the point home. And that definitely applies here. I can’t put it anymore clearer here than to flat out say, “TNDOE, you fucked up. Big time.” Children only get to be in 4th grade one time, same for 6th grade, and all the others, and you have stolen that year from them. They have missed opportunities that could have enriched their lives only to spend the year being jerked around and manipulated so you could have your precious test data. Supporters of standardized testing like to down play the effects of testing on instruction. Fine, then riddle me this, why has instruction in science all but gone away in grades three to four? Why has the science test been canceled this year? After all it’s a provided by a different test vendor. Because the focus on reading and math overshadows the need for science. I’ve said it before and I’ll keep repeating it – when you have a system that focuses on accountability, all the focus is on the things you are holding people accountable for. Science and social studies counts less, and so therefore they get less focus. Art and music are not counted at all, so they have almost gone away completely in some schools. I’m not saying they need to be tested, mind you, but the approach for many schools is that if it’s not on the test, then we don’t have time for it, especially in our high needs schools. If you don’t think that’s a disservice to our students, then I’m not sure what your definition of disservice is. The reality is that schools and teachers have spent another year prepping kids for a test that they are not taking. Children missed field trips, special events like Dr. Seuss read-a-long days were either re-scheduled or postponed, and many other more joyful and necessary parts of education were stripped away while testing and test preparation took precedent over all else. How much instructional time, learning time, recess time, and special event time were sacrificed in order to prop up a process that we knew all along was flawed? Anybody that was involved in this fiasco who claims that this is all for the kids needs to take a good hard look in the mirror. Furthermore, let’s look at the stress and sacrifice we’ve demanded from our teachers in order to facilitate this canard. We forget that, despite Teach for America’s best efforts to drive them out, many of our teachers have families. Time with their families has been sacrificed in order to meet the demands of our testing policies. How many times did my own kids and I head out on the weekend for an afternoon of activities while my wife headed to school to make the necessary preparations to make her students TNReady? Now we tell her, and the other teachers who were there at school with her, that it was all for naught and we appreciate the time stolen from your children, and we’ll mention it next teacher appreciation day, but it wasn’t necessary this year. And don’t think for one minute that the time spent by teachers who don’t have children is any less valuable. Time was stolen and teachers would be fired for such incompetence, but I’ve yet to hear of anybody at the TNDOE suffering that fate. This fiasco speaks to our credibility as well. Politicians, administrators, teachers, parents, we’ve all made statements to children this year that now prove less then credible. We are constantly discussing the importance of kids’ “buy in” to the test. How do we expect buy in when we don’t hold ourselves accountable? Every teacher in every classroom is going to face that very dilemma at a heightened level next year, and students will be watching closely. Heck, the TNDOE even turned the Tennessee Teacher of the Year into a liar by creating a PR video that claimed everybody was TNReady when clearly we were not. Again, it is time to pull out that mirror. The TNDOE has begun damage control, but as we crawl from the wreckage it becomes imperative that changes are made. The TNDOE needs to tear down their echo chamber. They need to conduct panels with people who don’t just reflect their views. As an activist, I often get accused of just wanting to raise hell. Nothing could be further from the truth. I have a deep and ingrained love for our schools and their mission. My greatest desire is that a multitude of voices are heard and out of that, we arrive at truly best practices. Only by having open conversations can we truly improve the system. Unfortunately, based on the TDOE response to Dr. Looney’s cancellation of all tests for Williamson County Schools, I don’t have a lot of optimism. My father always told me, “Don’t start a fight till you have your own house in order.” Dr. McQueen can blame Measurement Inc all she wants for this fiasco but if she thinks her house in order, we’ve got real problems. A fight with Williamson County will most likely further illuminate the need for legislators to hold hearings on exactly what went wrong. Does Dr. McQueen really want to explain in front of them why she’s trying to hold WCS accountable when she doesn’t even know who is going to score those tests or when. It’s my opinion that energy could be better focused on getting her own house right. And I don’t mean starting another task force. Too often, leaders fall into the trap of thinking they are leaders simply because they’ve been appointed to that position. Truth is, you only get to be a leader if people decide they are going to follow you. Dr. McQueen is facing her Waterloo right now with this crisis. Will she rise to the challenge and make the necessary changes that will restore people’s faith in the system? Will she begin to broaden her counsel and give dissenting opinions a seat at the table? Will she come to the realization that the test should serve the needs of students and not students serving the needs of the test? Only time will tell but again, I am not filled with optimism. After all, she herself said she is disappointed that we won’t be able to take this test, not about the actual loss of meaningful instructional time nor the wasting of student’s time and energy that could have been better focused. I don’t know what the solution should be. Take a year or more moratorium from all statewide testing? Re-evaluate what we will use these tests for in the future, now that we have more freedom under the new ESSA? Reduce the amount of tests we give? What is the purpose of education? Why do we test? What is the proper amount of testing, and how can we all collaborate on what is best for our students? Perhaps this post isn’t the place to answer that question, but you know me, I want you thinking. I agree with you whole-heartedly. So much valuable teaching time has been lost to these worthless TnReady tests. Candice McQueen blames the vendor. She has turned out to be a disappointment. She is not acting on behalf of Tennessee public school students. A real leader would say, “Stop these tests. Period. For everybody. They are bad tests.” I am invested in public schools. I am a teacher and I have grandchildren in MNPS.